You know when Christmas is over and a new year starts, you start off in a great mood and want this year to be the best year yet, then the cold and flu checks back in to say hello and until you've got some summer plans in place, you just feel a bit meh... well that's me right now. Although I am trying to remain positive this year! I have three holidays planned so far, but nothing booked as of yet, and whilst the thought of a provisional holiday booking is great, the booking confirmation in my inbox is what I need now. So to get me more in the mood, I have been swimwear shopping! Yes swim is in! 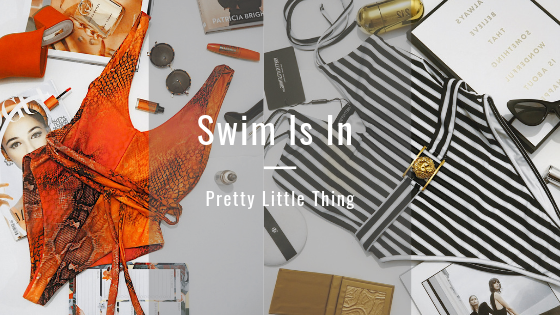 I have kindly been gifted the items I am featuring in this blog post from Pretty Little Thing to try out their new spring/summer 2019 swimwear and beachwear range. 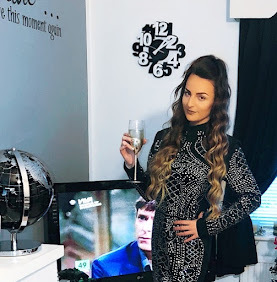 I am a big fan of pretty little thing anyway, and have been purchasing their clothing for years now so I knew I could expect good quality pieces, that are on trend, and so affordable for you guys. Firstly I chose this black mono stripe lion belted swimsuit. Is this the swimsuit of all swimsuits. It's high leg which I love, and v neck which I find very flattering; and it's black and white... what more could you want? No but seriously, I think a swimsuit like this is timeless, classy and elegant. I'm so pleased the low v swimsuits has disappeared this year because it took me so long to sit and sew them up haha. I like everything secure when I'm on my hols especially, dipping in and out of the pool and dancing with a cocktail in hand. I actually think these high leg swimsuits would make a great bodysuit for a summers day / holiday mode, or even evening out outfit. I think this black and white swimsuit with a white pair of belted shorts, or white high waisted trousers would look insane. The next item I chose was this pink reptile tie waist swimsuit which they also do in a fab black and white combo! I am still so in love with snake print, zebra print, leopard print... actually just any animal print, right now ha; and I don't know what it is about summer, but as soon as the weather gets good my wardrobe colour scheme changes from black to bright orange! 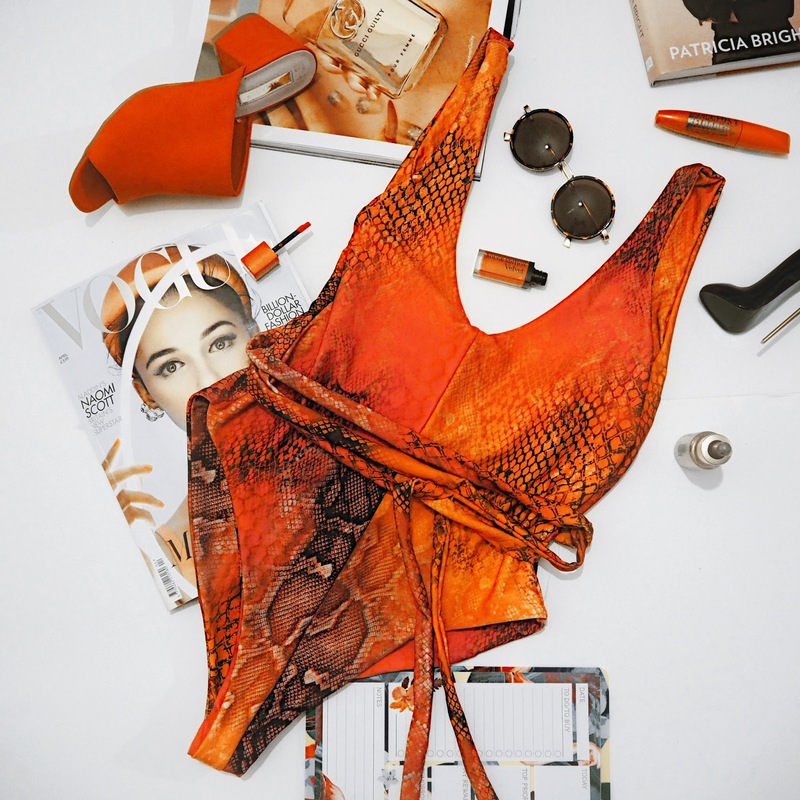 Bright orange is just my ultimate favourite colour every summer, and this bright orange and hot pink v neck swimsuit is my new all time fave. For some reason the pink didn't seem to show up properly on my camera, I guess we're not in summer yet so by the time I get in from work to photograph the natural light has gone! But I'll be sure to get loads of great pics in this on holiday. I think again, I would 100% get away with wearing this tie waist swimsuit as a bodysuit too. Paired with some pink tinted sunnies, some bright orange sandals and a white denim mini skirt, that's an ootd right there! Have you started your summer swimwear shopping yet? If not I would highly recommend checking out PLT's new collection. Which is your fave? I can't quite decide! For more fashion content don't forget to come follow me on Instagram.